Want To Start Feeling Great Again? Being sick, stressed, or in pain is frustrating. Especially after having been to multiple doctors appointments, specialists, or trying drugs and therapies that don’t seem to work. Its time to discover the missing piece of the health care puzzle. Eating well, exercising, managing stress are all important components of healthy eating. However, most people don’t know that having an optimized spine and nervous system is the cornerstone to a healthy life. Hi. My name is Dr. Walter Salubro. 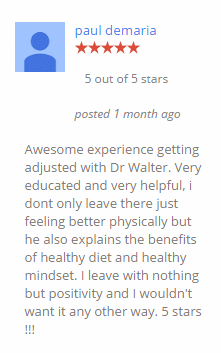 I’m a doctor in Vaughan and the author of Back to Health by Choice. I am tired of seeing people in our community being sick, stressed, and suffering of pain. I am concerned that people in our community are at risk of never experiencing great health, elevated energy, and a zest for life. If this sounds like you, then it’s time to discover the missing piece of the health care puzzle so you too can elevate your health and live better. Click on the link below to register for this FREE seminar. Space is limited to 27 people and we always fill up. Share with a friend that needs to be at this seminar.